For those who are unfamiliar with the functions of the Anti-Corruption and Civil Rights Commission, the packed schedule of its chairperson, Pak Un-jong, may come as a surprise. Her engagements include on-site visits, briefings to the National Assembly to provide in-depth understanding of the agency's wide range of efforts to fight corruption, and preparation for next year’s International Anti-Corruption Conference, among others. Perceived as a philosopher of law with rich experience in academia, administrative affairs and policy setting, Pak was tapped as the sixth chairperson of the Anti-Corruption and Civil Rights Commission in June 2017. Pak highlighted the importance of public-private cooperation and better protection of whistleblowers in achieving better public administration. “South Korea’s whistleblower protection law has an outstanding system, but lags behind in offering practical help to the public,” Pak said. 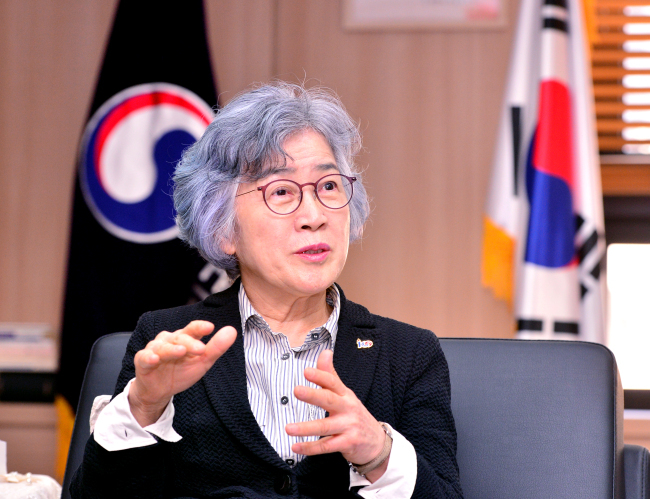 From the start of her journey as commissioner, Pak vowed to raise Korea’s Corruption Perceptions Index that had been dealt a blow by the massive corruption scandal during the previous Park Geun-hye administration to rank in the top 20 of the 180 countries surveyed by 2022. Backed by efforts including a five-year plan to fight corruption, which Pak named as one of the most memorable projects she has started since taking her post, South Korea’s Corruption Perceptions Index 2018 scored its highest ever at 57 points. On a scale of 0 to 100 points, a higher score means a higher level of integrity in the country’s public and political sphere. Korea ranked 45th among the 180 countries surveyed, up 6 places from the previous year, and 30th out of the 36 OECD countries, according to Transparency International. Pak attributed the result to improvements made in the public sector and businesses as a result of the Improper Solicitation and Graft Act that took effect in 2016. “Starting with the implementation of the anti-corruption law, South Korea has made significant progress in eradicating chronic problems involving bribery,” the agency said. “In the business sector, South Korea’s age-old culture of ‘entertaining’ clients, which had seemed difficult to change, has gradually disappeared. This has brought about a more transparent business environment,” it added. “(Korea) received the highest ever score. This is the international society’s evaluation of (Korea’s) efforts to liquidate the past,” President Moon Jae-in said of the country’s performance in the Corruption Perceptions Index. Moon also pointed out the country’s rating is relatively low on a global scale and should reach the OECD average of 68.1 points by expanding the function of the council for anti-corruption policies and establishing special investigation team on irregularities by high-ranking government officials. Echoing Moon, Pak noted that the country remained weak on overall corruption, attributable to collusive links between business and politics, and lax punishment for corruption. To resolve such shortcomings, Pak is eyeing to revise anti-corruption policies to include government officials’ improper solicitation of civilians. Legal measures to enhance protection of whistleblowers are also necessary, she said. In fact, the revised law allows a lawyer to report irregularities on behalf of the whistleblower. Keen on stepping up Korea’s fight for transparency, the 19th International Anti Corruption Conference will be held here in June 2020, inviting renowned figures from around the world. Among the attendees will be President Moon, the heads of anti-corruption agencies from the US, France, Germany among others, as well as leaders of international organizations OECD, IMF, UNDP, World Bank. “It is timely (for us ) to host the biggest anti-corruption event. International society is paying close attention to how South Korea overcame a crisis with mature civic consciousness, within the boundaries of democracy,” Pak said, referring to public-led candlelight protests against the influence-peddling scandal that led to the impeachment of President Park Geun-hye in 2017. At the IACC, the agency hopes to promote Korea’s image as a transparent country of integrity and bolster public and private sector cooperation for anti-corruption. The first IACC was held in Washington, D.C. in 1983 and has developed into a biennial conference. Some 2,000 officials from 140 countries, civic groups and international institutions attend the event. In addition to formulating plans to fight corruption and attending government meetings, Pak often makes on-site visits to experience firsthand the public‘s demands and project outcomes. Last week, Pak received a warm welcome by residents of an apartment complex in Uijeongbu, Gyeonggi Province, where roughly 4,000 households had filed a group complaint in 2017 about severe noise from a highway passing through the area. After arbitrating a two-year negotiation between the Korea Land and Housing Corporation and the Ministry of Land, Infrastructure and Transport, a soundproof wall and soundproof tunnel will soon be installed on the highway. “I think this is an example of how good administration makes good citizens and vice versa,” Pak said.